Party is the good time to let your hair down and have some fun. It is the time to unwind and to get out of your shell. And being the host means so much responsibility. You must ensure that the party will be great. So, you must make a good preparation no matter how much it cost. But the time went quickly and all of a sudden, the party’s over. Thus, leaving the house look terrible and in chaos. Daunting, isn’t it? Parties and celebrations at home needs thorough restoring the next day. But the last thing you want to do is cleaning the aftermath. Just the thought of it is exhausting enough. Hosting a party causes some chaos and mess. But worry not! 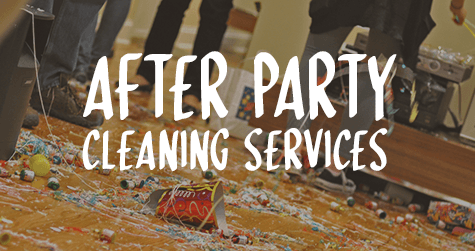 Don’t trouble yourself with after party cleaning, just leave the dirty work to us! Maid in Perth can perform a high-quality service at the best price. We have teams of skilled professional cleaners which can handle any party mess in a smooth way. Furthermore, we understand how important it is to clean your home as quickly as possible. For this reason, our cleaners are available anytime for your convenience. Whether it is an anniversary celebration, children’s party, wedding, or just a get-together, and either you want an after party cleaning or spring cleaning, trust us to put everything back in order. No need to worry about the rubbish, we will dispose of all of it in no time. We will make sure to clean every corner of your house. Our dedicated after party cleaning team is fully trained with dealing all types of cleaning dilemmas. We will accommodate any special request. As long as they are achievable. And are not beyond our capabilities. If there has been a major accident of spilled beverages in any of your upholstery or carpet, we will sort it immediately. Don’t hesitate and enjoy the party whilst being the perfect host for your family and friends. Relieve your worries. With Maid in Perth, rest assured your after party cleaning will make your house as clean and spotless as before. Book an appointment today!